Update :: The Wool n’ Spinning Shop. These punis-style rolags are a blend of natural, undyed Corriedale and natural grey Alpaca. 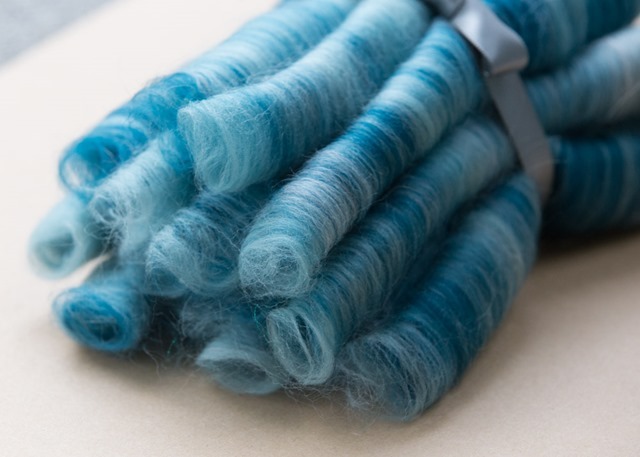 A total of 2oz, these light and lofty punis are wonderful for beginning spinners, particularly for spindle spinning, as Corriedale is a longer-stapled fibre and doesn’t tend to ‘run away’ from new spinners. I love Corriedale – it may not be as soft as Merino but it has a lovely lustre and is still next-to-the-skin soft. 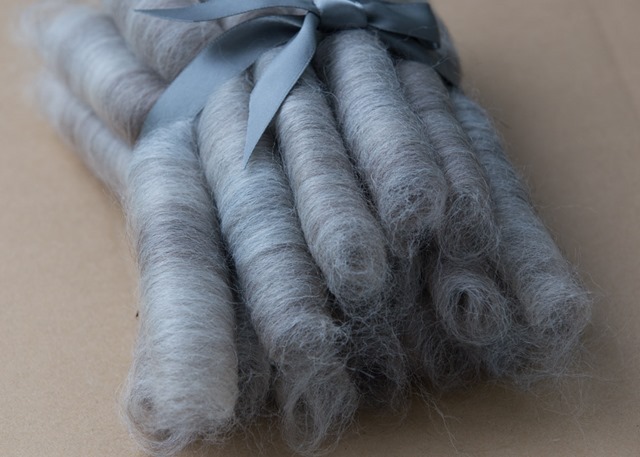 The natural grey Alpaca adds warm, lustre and loft. These punis-style rolags are a blend of natural, undyed Corriedale, Merino, superwash Merino and silk. Subtle yellows, greens, undyed creamy Corriedale and soft blue-greys remind me of the Cascade Mountains around our home. A total of 2oz, again these slightly longer punis (when compared to the above punis) are great for beginners as they won’t run away from you! 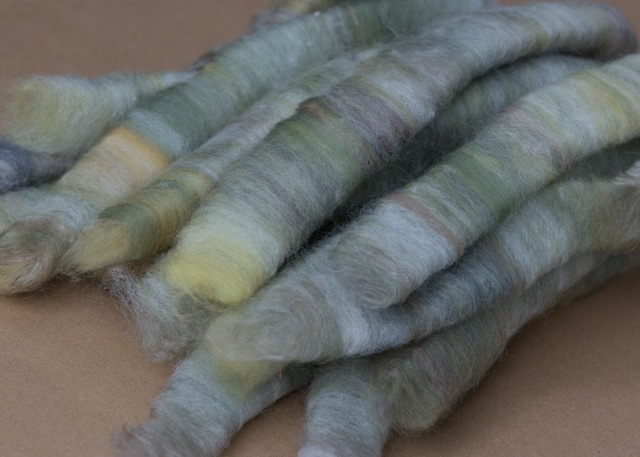 These punis will create wonderfully textured art yarns due to the myriad of fibres and textures. Am I allowed to be totally biased and say that these might be my favourites from this week’s update? Robin’s Egg blue, grey Alpaca and dark teal blend together in these punis-style rolags. 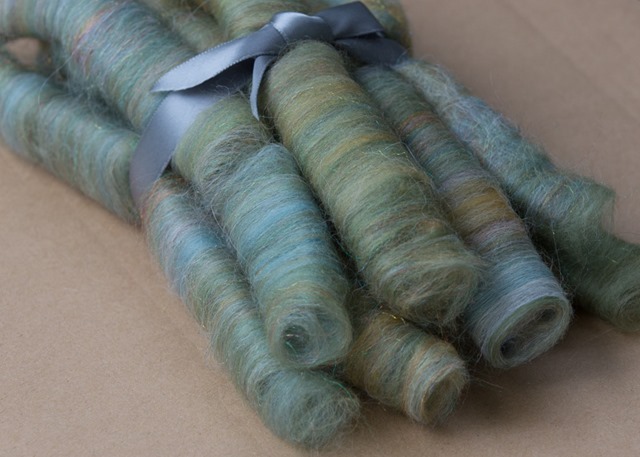 Again, great for beginning spinners, these punis will create a lovely heathered art yarn. Approximately 2oz, I am absolutely able to fill a larger order if required. Just message me! Lastly, subtle yellows, greens and greys mixed with the bling of Firestar will create a lovely art yarn that sparkles and shimmers. This little collection of punis-style rolags is a mixture of Merino, grey Alpaca and firestar. Approximately 1.5oz, these punis will be wonderful for a beginning spinner to play with as they are slightly longer than the above blue punis. Next Post Episode 5 :: Rebranding & Spinning Punis.